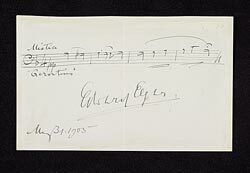 Elgar, Edward, 1857-1934. Dream of Gerontius (Album leaf) . Dream of Gerontius (album leaf) : autograph manuscript, 1905 May 31.